When it comes to kitchens, function might come first, but form and looks easily comes in second. This is especially true for people who feel the rooms in their home should reflect their personality. The kitchen is the heart of most modern homes. It is the room we gather in for parties, it is the place you can find the family on a lazy Sunday morning and it is where cook-offs occur between family members. It is the single most important room in your home. It also says a lot about who you are. This is why you need to match style and personality. It is not just in the way your kitchen looks, but also how it functions that makes it a perfect fit. 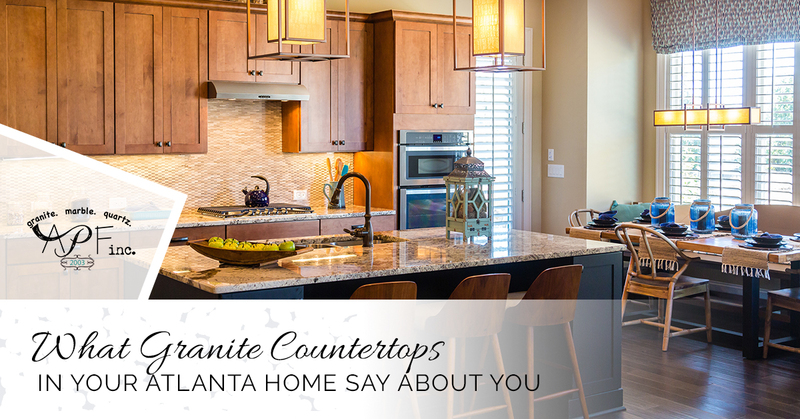 A Polished Finish, your source for granite countertops in Atlanta, wonders what your kitchen says about you. A charming cottage style kitchen features natural textures and a lot of muted tones. It is a kitchen that is warm and inviting. If this is the type of kitchen you have, you are probably a fan of the simple life and you shun city life for a countryside retreat. You enjoy spending quality time with your family baking cookies and making homemade soups. If your kitchen is filled with all of the coolest gadgets and decorated with sleek parallel lines with nothing out of place, you have a modern room. If you are a huge fan of technology, as noted by the Apple watch on your wrist and Amazon Echo on your countertop, you are probably the owner of a modern kitchen. There isn’t much that screams warmth in your kitchen; certainly not in the stainless steel appliances, white countertops and gray-tiles floors. You are the type of person who feels a cluttered home reveals a cluttered mind. You are also the one who keeps up with the latest technologies and owns the newest gadgets. You subscribe to magazines that highlight the latest trends and you are always looking for ways to make the rooms in your home more efficient. When you have more seating in your kitchen than what your family size requires, it shows that you are the type of person who welcomes extra guests. Extra bar stools at the kitchen island imply that you want guests to pull up a chair and stay for a while. You have black countertops in your kitchen with white cupboards. The backsplash in your kitchen is checkered black and white and the dish towels hanging on your black stove are white with black polka dots. If your kitchen is done in all black and white, it tells others that you are confident and sophisticated. It might also tell others that you don’t know how to color-coordinate so you just took the easy way out. You have a stainless steel refrigerator, which just happens to match your stainless steel range, microwave and dishwasher. You have a chrome backsplash, which is great because it mirrors the metallic tile on your floor. This metallic kitchen tells others that you are driven by success and you are a go-getter. You also love entertaining and are the type of person who throws wine and cheese parties. Your kitchen is in a constant state of disarray. At any given time, the sink is full of dirty pots and pans, there are food crumbs on the table and there are spaghetti sauce splatters on backsplash above the stove. Your kitchen is messy, not gross, just cluttered and unorganized. This type of kitchen lets others know that you lead a hectic life and whatever downtime you have surely isn’t spend organizing your kitchen, or any other part of the house either. Your kitchen is decorated with bold colors like red cupboards, royal blue appliances and gold countertops. You choose purple dishtowels and have gold pots and pans, even your lime green kitchen rug shows off your daring side. This type of kitchen shows others that you are creative and outgoing, right down to the vibrant blue backsplash. Regardless of the type of kitchen you have or your personality type, call A Polished Finish when you need new countertops.